We are delighted at the interest shown in our customer’s cars so we would like to extend this out to you further. If you have a Classic or Modern Car including Jaguar, MG, Triumph, Morris Minor, Mini or even Mazda MX-5 then either pop over to the David Manners Group or send us your pictures and we will feature them online. We have had several international customers that are restoring cars and each step of the way; they have been sending us pictures and a short story of the progress they are making. Many of our classic car customers carry out restoration work on their cars and rely on fellow car owners to give them hints and tips so we are hoping that in time, we will have a nice library for our customers to dive into. If you want to get involved, please drop us a line below or on our Facebook or Twitter pages. 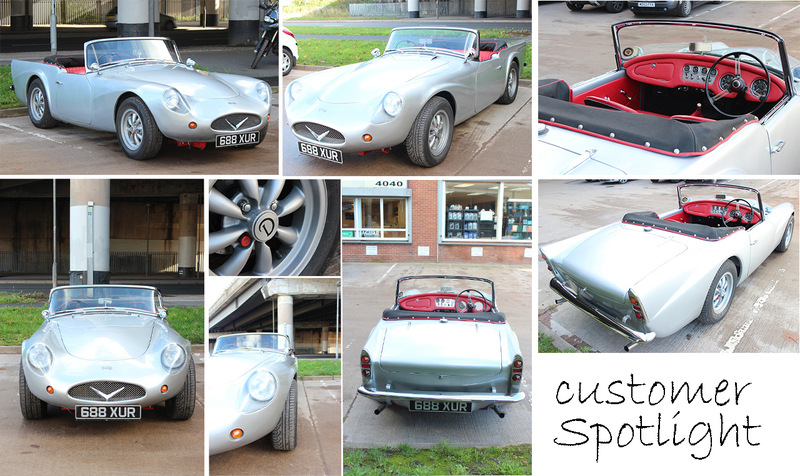 A few weeks ago, we featured the first Daimler Dart in our customer spotlight section. David, who was the owner of that Dart, kindly had his picture taken with our David Manners. 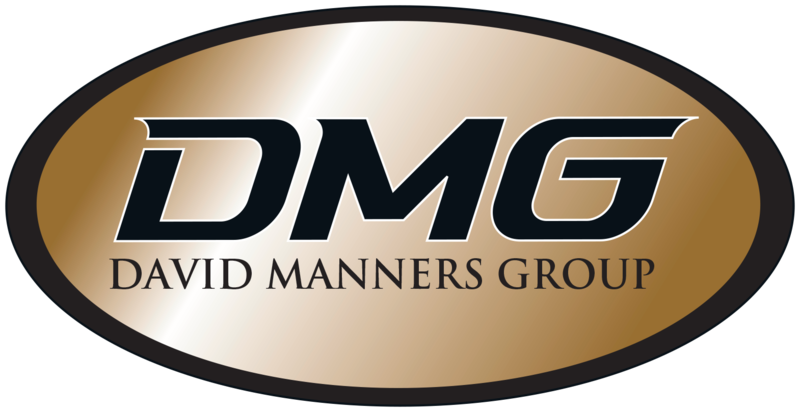 Infact as we mentioned before, the David Manners Group exists thanks to the Daimler Dart so everyone here at DMG holds the Dart close to our hearts. The same customer informed me that he owns and has owned a number of Darts over the years and always bought the parts from the David Manners Group. He has now completed the full interior and exterior restoration of this Silver Metallic Daimler Dart and wanted to show us the results of his work. Naturally we were delighted to talk to him and take some pictures to show you all. Since its restoration, the ‘New’ Daimler Dart has covered just less than 300 miles so it is still in the running in stage following the work David has completed. The Dart starts with ease and the engine boasts a purr that must be reminiscent of when it first came off the production line. The temperature on the day reads 11 degrees Celsius which is borderline advisory for having the top down, but with such beautifully crafted and matched interior, we don’t blame him for showing it off. David, the owner of this wonderful Dart is particularly proud of the Grille. It certainly adds a modern feel to the car without taking away any of its classic features. He commented that he wanted to give it a ‘Ferrari’ look. Whether or not he has achieved that, it is certainly a welcome modification to what has been an inspiring project to get this Daimler Dart back to its best. We have not been on Facebook that long. Infact, we only started interacting with our customers around a year ago via social media. 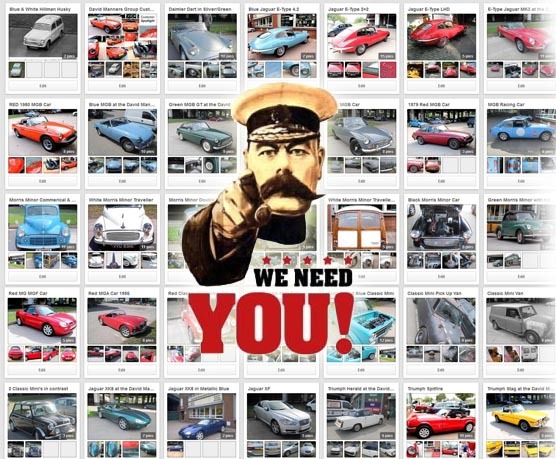 We always knew there was a lot of love for the Classic and Modern British cars such as Jaguar, MG, Triumph, Morris Minor, Classic Mini (and our adopted son – the Mazda MX-5) but we are pleasantly surprised with how our customers and fans have engaged with our stories, pictures and news in 2013. For each significant milestone on our Facebook site from now, we will endeavour to celebrate it with a gesture of goodwill. 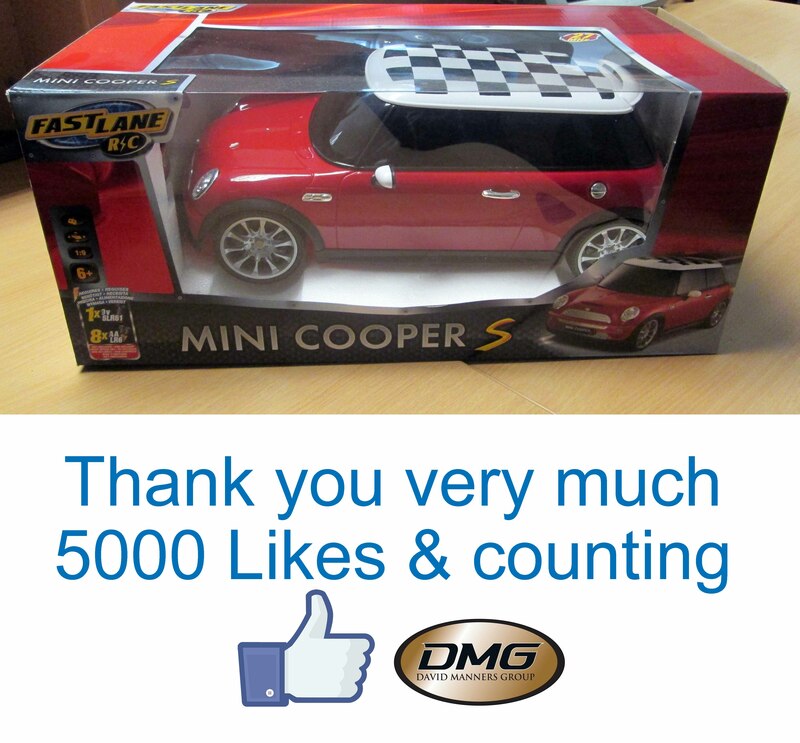 One lucky customer of ours has been offered the chance to claim his gift – a remote control Mini Cooper. So if you are reading this, check out our Facebook page and get in touch if it is you. We are also on Twitter if that is more your cup of tea. Thanks again for your support this year, and don’t forget you can send in your pictures for inclusion on our customer spotlight sections. Admittedly, when I first saw it pull on the David Manners Group car park I was thinking Starsky and Hutch. The Jaguar XJS replaced the E-Type in the Mid 1970’s but the only obvious retaining feature from its E-Type counterpart is the sheer length of the bonnet. Maybe this is why I was thinking of the Ford Gran Torino from the 70’s cop show. Of course the red colour had a lot to play in this. According to the website howmanyleft.co.uk only just over 1000 Jaguar XJS cars are left on the road which is staggeringly lower than you would initially think. The Jaguar E-Type was of course a hard act to follow and in many ways the XJS became somewhat of a scapegoat. But with only just over 1000 Jaguar XJS cars left British roads, they are certainly a head turner now which is why we had to get some pictures to show you. Later models of the XJS were more economical and the ones that are still left on the road need very little maintenance if looked after. On this particular trip to the David Manners Group, all the owner required was a few service parts to keep it ticking over through the winter. 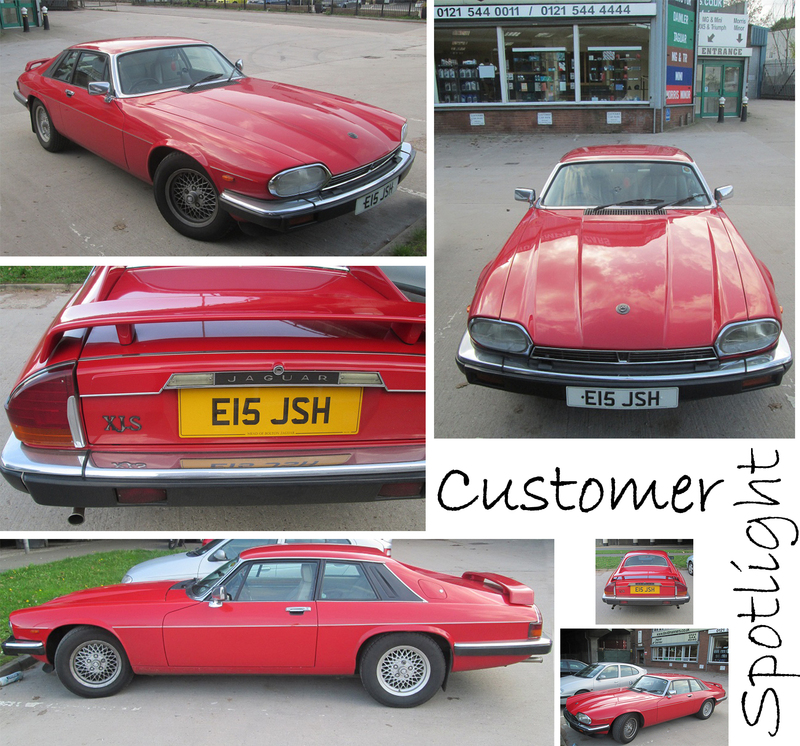 Thanks for the opportunity to take pictures, and if you own a Jaguar XJS, you can download a free Jaguar XJS price list from our website here. Today I had the pleasure of arriving at work to see a well-used Morris Minor Commercial parked on our car park at the David Manners Group. We are particularly fond to see old British classics still being used for what they were originally designed for, and this Morris Minor Van certainly fits this description. As you can see from the pictures, it is not in bad condition by any stretch of the imagination but is clearly still used to carry goods on a regular basis. The bodywork whilst kept to a standard is not the main priority at this stage of its working life. 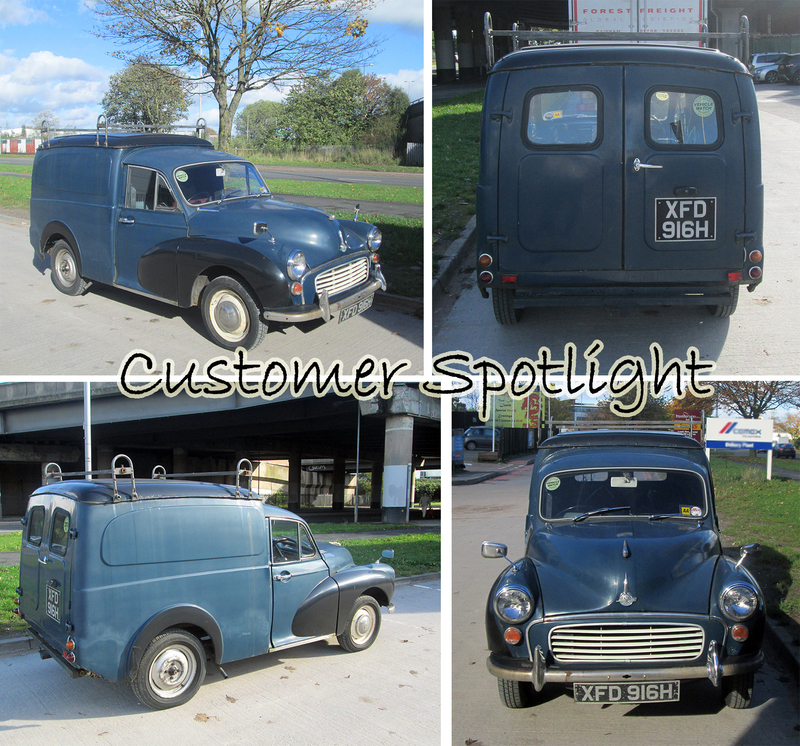 Infact the customer was busy purchasing Morris Minor Commercial Van parts to keep it in its roadworthy state throughout the winter months. Surely a clear indication it would not be relegated to the garage so a younger vehicle could deputise. You may be surprised to hear that owners of Morris Minors, Minor Travellers and Minor Commercials can easily drop by at the David Manners Group to pick up parts already in stock. Since the acquisition of the Morris Minor Centre (Birmingham) and the incorporation into our premises in Oldbury, the opportunity to hold large quantities of stock rare and popular has seen an influx of customers who just want to get their Morris Minor Car back on the road. As you may have read on our news page yesterday, the David Manners Group will be featured on a Car restoration show early next year supplying parts for the build of a Morris Minor Traveller. You will get to see our Morris Minor Parts warehouse first hand. In the meantime, don’t forget to check out our Morris Minor Parts website here. 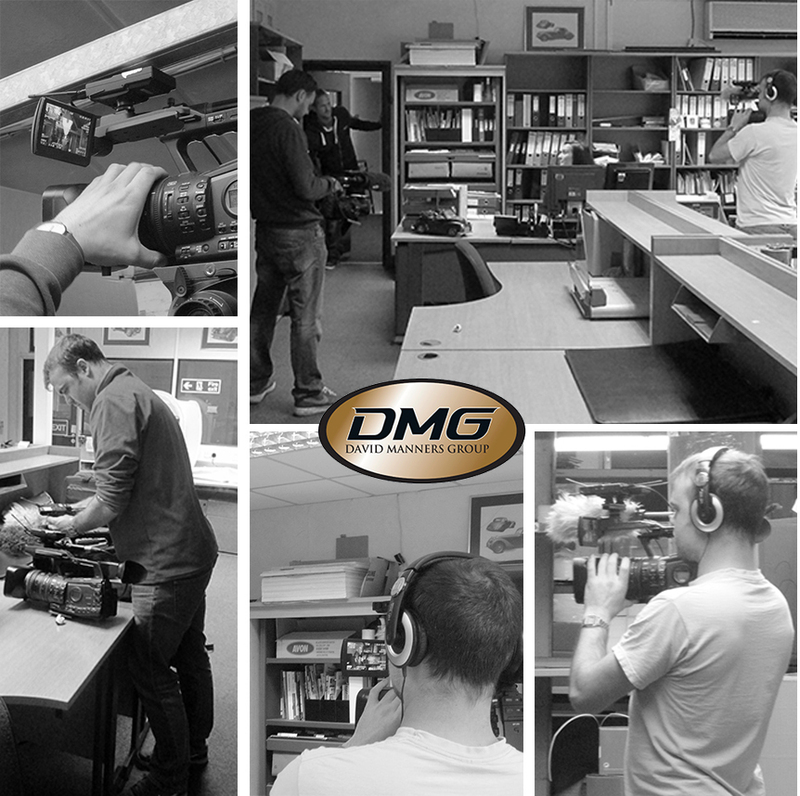 Last week at the David Manners Group, we finished filming the last segment for our appearance in a Morris Minor Traveller restoration project show to appear on Television early next year. We thought it would be an interesting idea to cover the story from behind the scenes. We are not permitted to show the progress of the car – We leave that to the day of broadcast so tune in folks. It was a great experience for all the Staff at the David Manners Group to be a part of. Especially for our Morris Minor expert ‘Mike Lennon’. Mike was the founder Member of the Morris Minor Centre (Birmingham) which is now part of the David Manners Group. Mike can verbally strip down a Morris Minor in conversation and tell you exactly what you want to know. The star of the show was Kate Manners’ PA, Vikki Jell. The ultimate professional. Follow our Facebook and Twitter pages for updates on this story. We will of course keep you updated with a schedule of when this programme will be viewable. We were going to make you guess what this car was as the picture I took was so blurry, but we will just come clean. 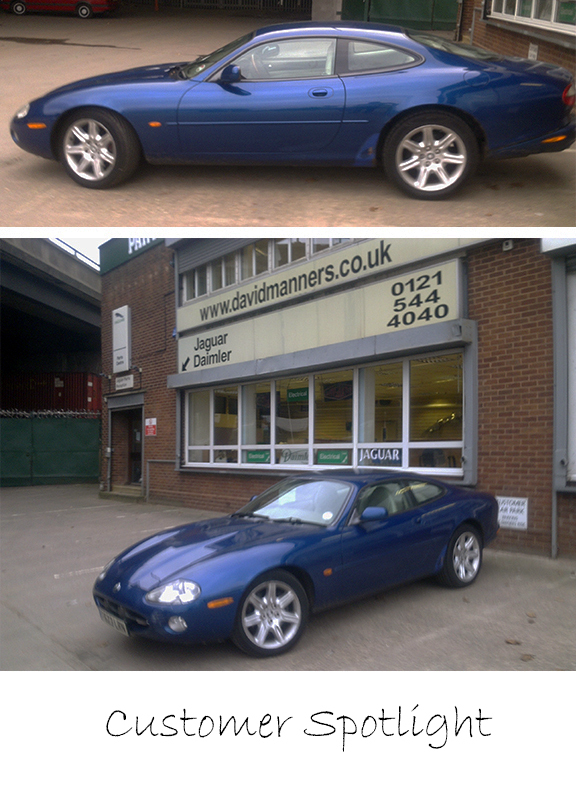 This is a fine example of a Jaguar XK8 parked at the David Manners Group. We featured a Jaguar XK8 in a metallic green colour a few weeks ago that was the same shape as this week’s model but in a 2 way contest, I would suggest that this one just edges ahead on appearance and a colour that won’t quit. We never got to meet the owner for a few more pictures as it was quite late and I noticed the car after clocking out time, so the pictures were hastily taken on mobile phone whilst the customer was buying parts from our trade counter. If you are the owner and you happen to read this, please get in touch as we would love to check out the interior.